Sometimes it’s just a means of survival, but also I have yet to meet someone who doesn’t have some deeper affection for food beyond its bare necessity. During our months here at WYA, the interns have learned much about living in international community, experiencing New York, and surviving on a budget. We’ve had some memorable times together as a result, and the foods we have cooked, eaten, or shared have made their own contributions to our memories, community, and cultural experience. Stéphanie: Stéphanie bought a bag of Betty Crocker chocolate chip cookie mix one day during lunch break, and baking it soon became a house-wide event. All of the interns had ideas for additional ingredients to expand the batch. Oats, peanut butter (an intern favorite), yogurt, cinnamon…these were no basic cookies by the end of the whole affair. The way Stéphanie sees it, the creation of something new together also created a feeling of solidarity, friendship, and unity of cultures. Because who doesn’t love cookies for lunch? Perhaps it is baking (or Betty Crocker) that will save the world. Kathleen: “When you move out, you realize that anything is possible. 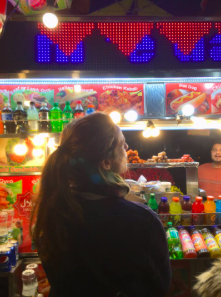 Especially in New York, amid the constant flow of so many different lives, the multiplicity of lifestyle and food options is overwhelming. Do you want to live like the poised business woman sipping a protein smoothie as she struts down the sidewalk? Or the harried nurse grabbing a breakfast sandwich on the way to 7 am shift change? Or the woman dragging her sleeping bag down the sidewalk, eating a granola bar from the food bank? There are more ways to live than we can imagine. And they are all possible. You find your feet amid the chaos, and figure out who you are and how you will live. I eventually found a lifestyle equilibrium and made sense of the place that food holds in my life. But until then, things were chaotic. 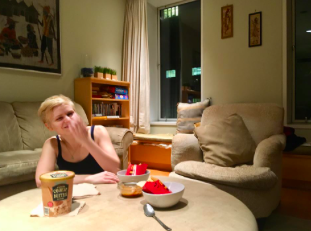 Pam: Pam has her own smorgasbord of food-facilitated memories from the past few months. 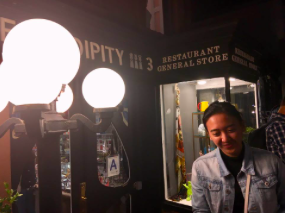 There was the time when all of the interns made an expedition to Queens to buy ingredients only found at a Filipino grocery for an upcoming Asian potluck, and stopped at the world-renowned Jollibee fast-food chain (world-renowned among Filipinos, that is). 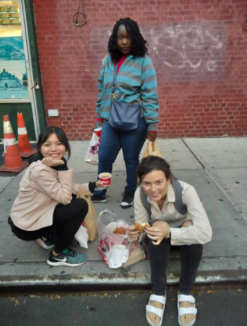 Fried chicken and sweet spaghetti were consumed on the curbs and buses of Queens that day. Or there is always the customary intern stop at 99-cent pizza, walking home after a day at the UN. Pam also hosted her own African night here at WYA, cooking Pilau, a Kenyan favorite, for the whole house. No matter the instance, eating and conversation have come hand-in-hand. 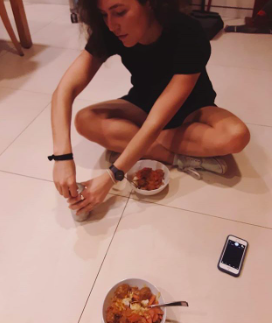 Mary Grace: As one of the Filipinas in the office, Mary Grace had the pleasure of demonstrating how to eat a Balut, a very famous delicacy in the Philippines which consists of a fertilized duck egg. As the interns watched, however, it turned into a science class and we ended up dissecting the egg, which was a new experience even for Mary Grace. 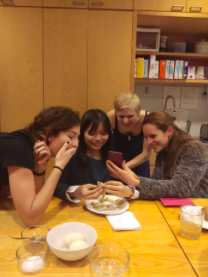 With its contents no longer a mystery, Mary Grace says that “no one else tasted the Balut so I ended up eating all three of them.” This was a bonding experience for everyone in attendance. Clare: Recipe for Midnight Clean-the-Fridge Curry, created and enjoyed with Kathleen. Come home late after a night of walking a total of several miles to avoid the $2.75 metro fare (dollars which must be saved for coffee). You’re craving curry. Let’s see what the kitchen holds! Sauté onions, add your collective stash of vegetables—which is carrots—and any spices that seem applicable. Tonight it’s turmeric, cumin, cayenne, and more cinnamon than seems correct. No chicken? Frozen meatballs! Simmer with brown sugar, yogurt, and some leftover masala sauce. Serve over rice, split the unclaimed beer in the fridge, and eat on the floor. Musical accompaniment provided by an East coast Canadian band and the sound of the rain coming in through the open window.